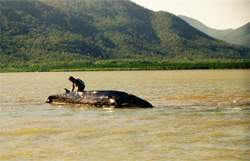 On 24 August 2000, this Bryde's whale died in Trinity Bay, just 2 km from Central Cairns. 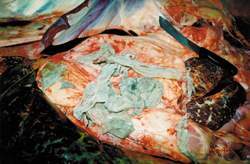 An autopsy found that the whale's stomach was tightly packed with plastic. This included supermarket bags, food packages, bait bags, three large sheets of plastic 2m x 50cm and fragments of garbage bags. There was no food in its stomach. A plastic bag dropped in the street can quickly find its way into a stormwater drain which takes it straight to the ocean. 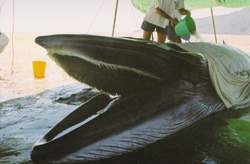 Bryde's whales, like Minke's and humpbacks, feed by taking large amounts of water into their mouths and filtering out small fish and other food from it. They use baleen, the fringe which you can see at the top of its mouth to sieve out food. 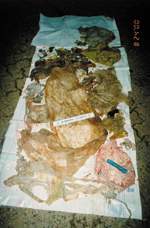 Unfortunately, plastic and other rubbish in the water is also swallowed and since it cannot be digested or passed, it stays there.